Attention Guests- we are in the process of renovating our lobby for your future enjoyment. While the renovations are taking place- we are relocating our lobby for your convenience. We look forward to serving you and making sure your stay is as comfortable as possible. Thank you for your patronage. The Hampton Inn Houston I-10W/Energy Corridor TX hotel is located on the west side of Houston Texas towards San Antonio. 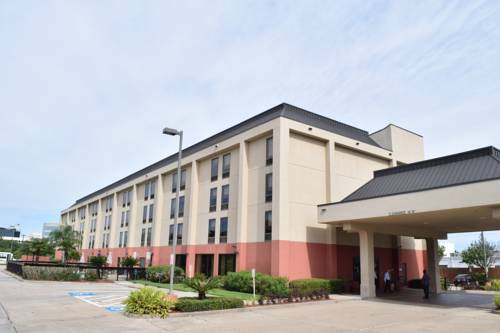 Located off the Katy Freeway the Hampton Inn hotel is within 2 miles of the Houston*s Energy Corridor with easy access to all parts of Houston Texas. Nearby the Hampton Inn Houston I-10W/Energy Corridor there is shopping that includes Memorial City Mall Katy Mills Outlet Mall and the Galleria. There are also 4 restaurants within walking distance of this Houston Texas Hampton Inn hotel such as King Fish Market Carrabba*s Italian Grill IHOP and Taco Cabana The Hampton Inn Houston I-10W/Energy Corridor hotel in Houston Texas features 120 rooms non-smoking rooms a fitness center a business center with complimentary high-speed internet and an outdoor pool. Additional room amenities include complimentary local calls complimentary wireless high-speed internet access in-room coffeemaker hair dryer iron/ironing board connecting rooms and cribs. Laundry/valet services and meeting/banquet facilities are also available at this Hampton Inn hotel for an additional fee. Guests of this Houston Texas Hampton Inn hotel will also enjoy the complimentary On the House hot breakfast and the On the Run breakfast bags /available Monday-Friday/. We love having you here are the Hampton Inn I-10W/Energy Corridor TX hotel in Houston Texas. Casual Italian. Grilled specialties are cooked over our wood-burning grill and feature Pollo Rosa Maria and Chicken Bryan Texas. 24 hour diner. Specialize in breakfast. Mexican food served in a casual festive atmosphere. Casual fresh fast Mexican food.